Astra Trading GmbH is an international trading company focusing on the sourcing and supply of railway spare parts. We are maintaining very good relationships with the established suppliers and are very keen in assisting you with the sourcing of available, discontinuing or phased out products. 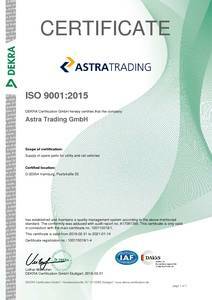 Now ISO 9001 : 2015 certified!